The Pacific NW's best decking... Welcome to our Ipe Decking and Accessories page. Here you will find the listings for the various sizes of Ipe we have in stock. We also have in stock the stainless steel decking screws, Ipe plugs and hidden fasteners like Ipe Clip, Proplug and Eb-Ty supplies. 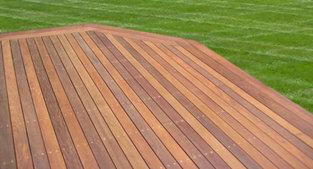 After its fastened down, don't forget your Penofin Deck oil; which brings out the color and grain of your new Ipe deck. Working with sustainable sources, we are able to guarantee the most consistent and highest grade for our customers at great prices. 1x4 Eased 4 Edges NET 3/4" x 3-1/2"
1x6 Eased 4 Edges NET 3/4" x 5-1/2"
5/4x4 Eased 4 Edges NET 1" x 3-1/2"
5/4x6 Eased 4 Edges NET 1" x 5-1/2"
Used for boardwalks, used in city parks, used for siding. Tip: We recommend that you sand Ipe before applying finish. This helps to remove dust and grit that can inhibit the decking oil from penetrating.